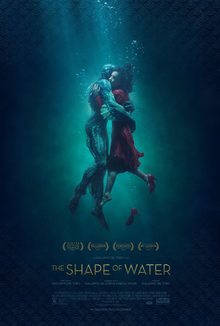 ‘The Shape of Water’ is a gorgeous romantic fantasy from the mind of Guillermo del Toro, depicting the blossoming romance between a mute women and an underwater creature against the backdrop of the Cold War in 1962. The film takes place in Baltimore and largely splits its time between a high security government facility where the creature (credited as ‘Amphibian Man’) is held, where Elisa (Sally Hawkins) works as a janitor, and Elisa’s apartment above a theatre. Elisa is introduced as a shy individual, primarily as a result of the injury that rendered her mute, and she only really spends time with her gay next door neighbour Giles (Richard Jenkins) and her co-worker Zelda (Octavia Spencer). Hawkins plays her as an old school romantic who loves old movies, yet someone who is also resigned to never finding someone. In discovering the creature she identifies a kind of kindred spirit and things blossom from this point onwards. Inspired by old school creature features such as ‘Creature from the Black Lagoon’, this is comfortably del Toro’s best work since ‘Pan’s Labyrinth’ and it’s as visually inventive as we’ve come to expect from him. Many of the flourishes reminded me of Michel Gondry at his most playful and there are elements of ‘Edward Scissorhands’ (a favourite of mine) in the fish out of water narrative (no pun intended). The ensemble cast are all outstanding (with three acting Oscar nominations clear recognition of this), with Jenkins, Spencer and Michael Stuhlbarg all impressing, whilst Michael Shannon’s scenery chewing performance as the primary antagonist mostly worked for me. However, there are two people who stand out and it’s the central duo, Sally Hawkins and Doug Jones. Hawkins is just a sheer delight as Elisa, incredibly charming, whimsical and she conveys so much through her body language that her inability to speak becomes irrelevant. As the ‘Amphibian Man’, Del Toro’s go to man Doug Jones once again dons a performance capture suit and he is terrific. He’s always been excellent in multiple roles across the likes of ‘Pan’s Labyrinth’ and ‘Hellboy’ but he really gets the chance to shine here, and his and Hawkins superb performances make us root for their unlikely relationship. ‘The Shape of Water’ works because it plays the fantastical elements straight and fully commits to its central love story, and I was really moved and bought into it. A love story like this doesn’t come into being without a few obstacles and most of these are provided by the shady government officials in charge of the facility where Elisa works. They are represented by Shannon’s Colonel Strickland, the man who captured the creature and now seeks to exploit it for possible advantages in the ongoing space race with Russia. I generally liked Shannon’s performance but he does become a bit too much of an old school villain towards the end, and I think his larger than life performance started to dominate the film to its detriment as we raced towards the conclusion. Overall I was really impressed by ‘The Shape of Water’, particularly in how del Toro managed to craft such an emotionally satisfying story from an unusual premise, and it’s great to see such a distinctive filmmaker’s work get the credit it deserves.